The most fascinating, inspiring and unique travel tattoos & their stories! 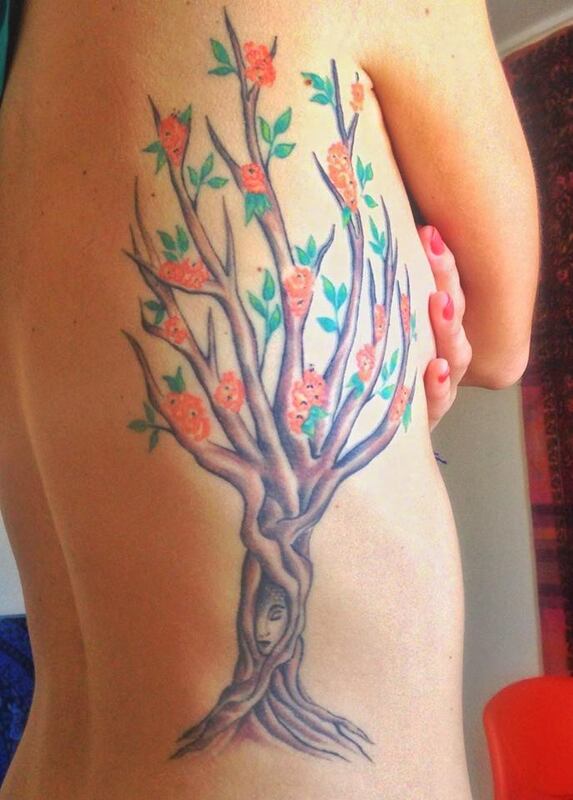 Tattoos are a very personal representation of our memories, experiences, feelings and emotions. For us they represent those things that leave a permanent mark upon you. 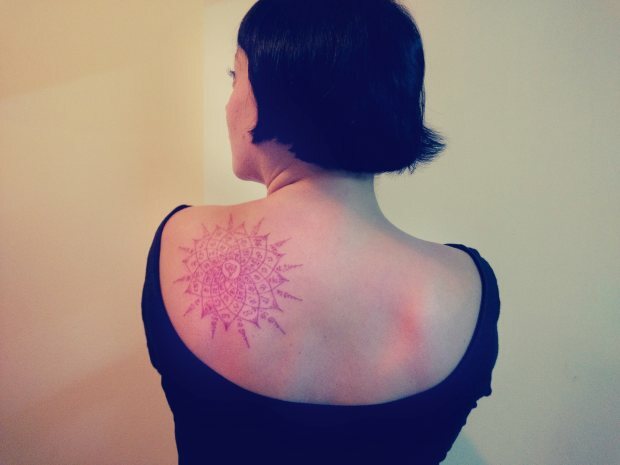 Here we have gathered together a unique collection of travel tattoos from us and other travellers. Here you won’t find any meaning less hipster, trendy tattoos. But deep and meaningful ones that carry with them a tale of faraway lands and adventure. Travel is such a huge part of our lives that we have several travel related tattoos…most of them on me (Nic!) 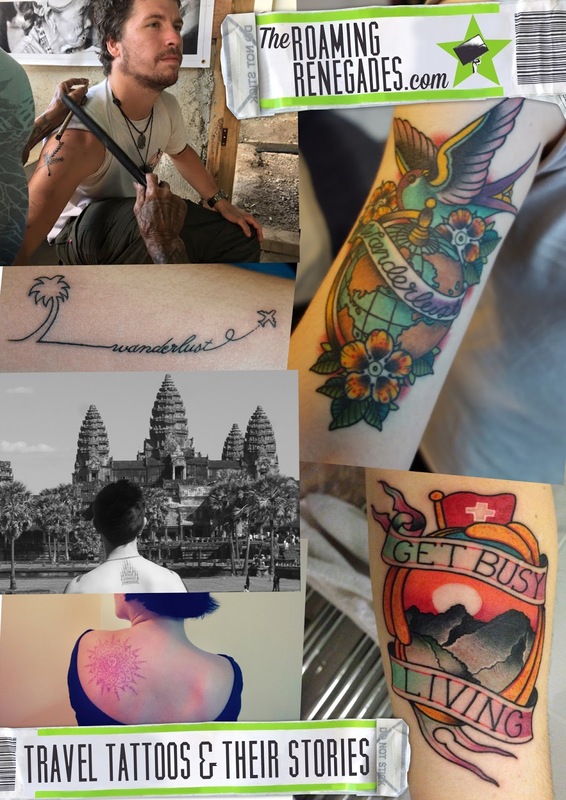 I was once even a tattoo apprentice a few years back and after finishing my degree in Fine Art wanted to pursue tattooing as a career…well that was before I was bitten by the wanderlust bug! I have 13 tattoos in total and all of them mean a great deal to me, I am someone who is very passionate and wears my heart on my sleeve (literally!). Tattoos for me are a way of marking memories, places people or times that were important to you, shaped you or left a mark on you. The first below represents our love for New York, a place that will always hold our hearts and the location we chose to get married! 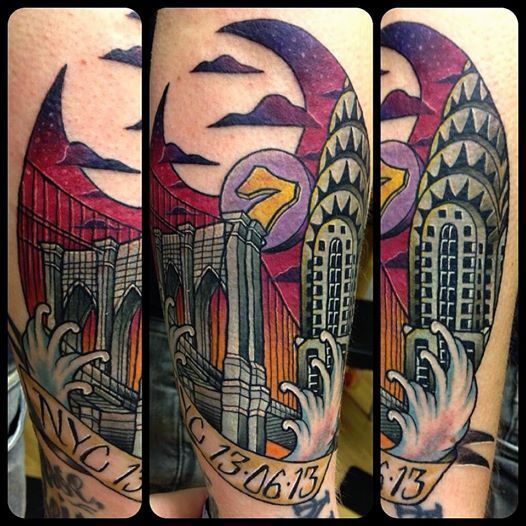 I picked out some of my favourite places such as the Brooklyn Bridge and the Chrysler building as well as the 7 train to represent the NY Mets! This one is our most recent…I say our as we decided to get matching tattoos to remember what turned out to be the trip of a life time over to Switzerland in the summer of 2015! The mountains in the background are the Eiger, Monch and Jungfrau of the Bernese alps. The writing “Get busy living” was also used by one of the adventure companies in Interlaken as well as being from one of our favourite films The Shawshank redemption. It resonates quite powerfully with us that you must live everyday to the fullest! The next two tattoos are old school sailor jerry inspired to represent my general wanderlust! 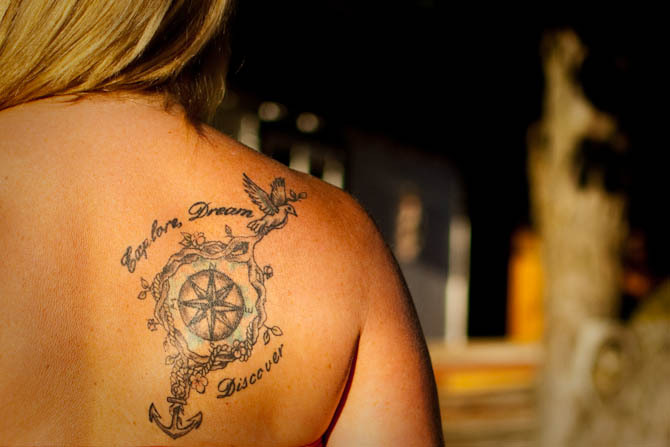 From images of the globe, flowers picked from foreign lands, the ship sailing off for new shores and the freedom of the birds, these tattoos are full of symbolism for a life of adventure and exploration! I had wanted a travel tattoo for a while. It was just a matter of figuring out what to get. A map? A globe? A plane? I wanted it to be different though; something of my own creation. I’m not sure at what point I thought of doing something resembling an EKG line. After a few initial ideas, I finally came up with a drawing that I loved. I wanted to represent my hometown of Miami and I have a thing for palm trees, so the first part of it was easy. Then, the word “wanderlust” because it is a desire that I have felt all of my life. And finally, a plane to represent going out and seeing the world. No, it’s not a Templar Cross, it’s a Maltese Cross! I have lived 2 years and a half in Malta, the small European island in the middle of the Mediterranean sea. I love tattoos so I got this one since the cross is the symbol of Malta and its archipelago in order to remember forever this amazing life experience. Fortunately it did not hurt at all! have the gao yord sak yant tattoo. 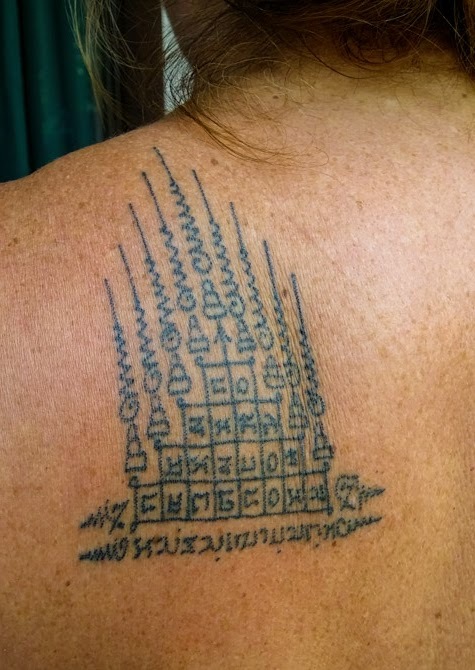 A monk in Thailand skewered me with a piece of bamboo dipped in an ink made from bamboo ash and snake venom, inscribing 20 magic spells inside an image of Mt.Meru, topped with nine Buddhas, at the top of my back. I went to Wat Bang Phra, a temple about an hour and a half northwest of Bangkok. 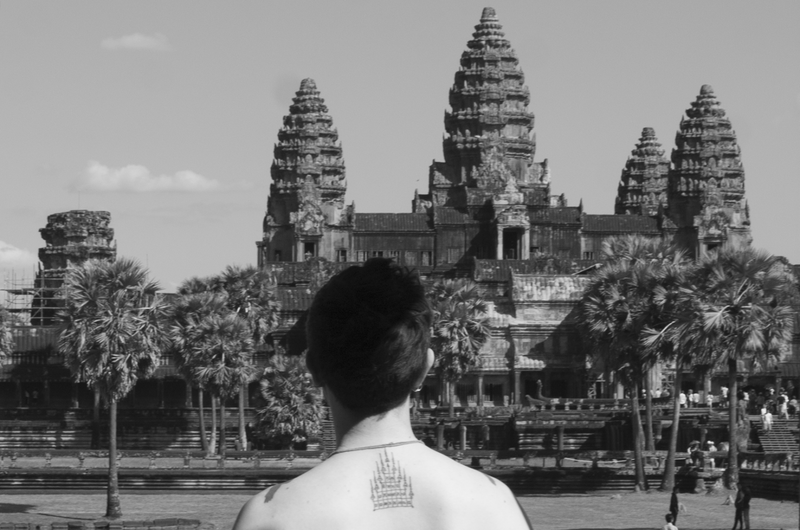 My tattoo is a representation of Mt Meru, the central world-mountain of Hindu and Buddhist mythology, and which Angkor Wat is also patterned after. 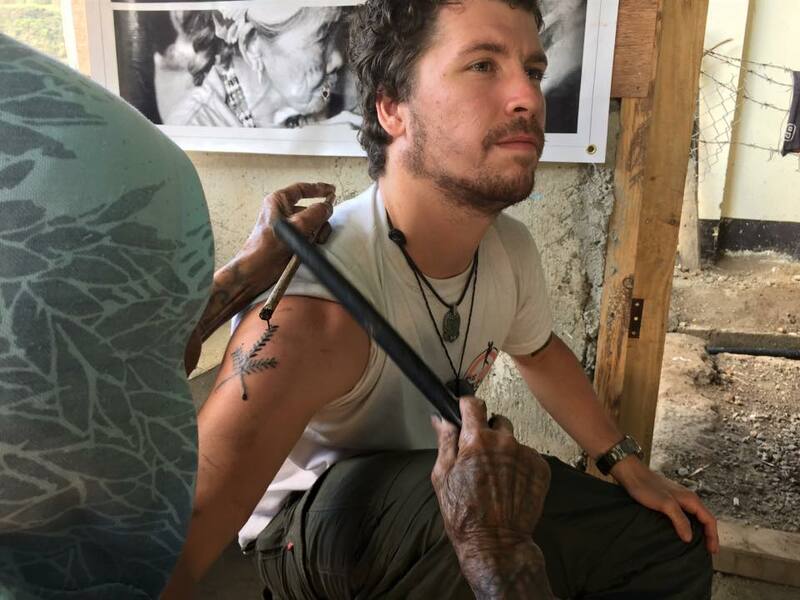 A few months ago I trekked through the Philippines to reach Whang Od, the last Mamababatok, or tattoo master. I had no idea if she would tattoo me, as I knew that she would only tattoo a Westerner if she liked them… so I was blindly hoping she’d like me. The tradition there was to tattoo using thorns, soot, and a bamboo hammer – a truly unique and wonderful experience! You can read about the whole adventure here. Nina from Where in the World is Nina? while in Thailand that I decided to go ahead and get one tattooed on my leg. and travel writer who’s ditched the 9 to 5 lifestyle in favor of something that lets her roam the world at her own will and follow her ever itchy feet. She is currently cycling between Istanbul and Berlin. We both got our tattoos done on the island of Koh Tao in Thailand. We were mid way through our year-long trip in the region and decided that we wanted a tattoo! These are the only ones that we have to date. The tattoos are written in the Thai language and mine means Let It Be, while Nick’s means Freedom. They both symbolize what we’re all about: going with the flow, and being free! 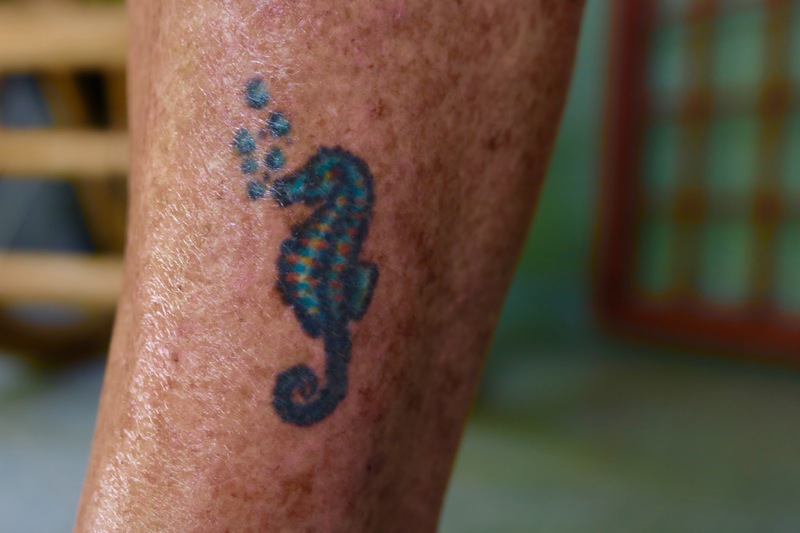 seahorse tattoo on her ankle. It’s been 13 years since I’ve inked myself. The first time was in a backstreet parlour in England: hastily done, hardly award-winning and although lovely in design, it’s not something I’m deeply in love with. Fast forward to last month and me and tattoos just got serious. In the middle of the Thai countryside, amongst the swaying trees and tranquility of nature, I had the honour of experiencing a monk bless me with a magical, herbal, sak yant tattoo. Tattooed into the body to protect the body and mind, this particular unique lotus design has the power to bring out my inner beauty, creativity and other peoples’ love. It’s my perfect travel tattoo and although bamboo tattooing is on a whole new level of decorating yourself, it’s a deeply spiritual and meaningful experience to go through. I urge you to take the plunge too. My first tattoo I got in secret. It’s a compass. Of course it’s a compass, because I’m a traveler and I needed to get a cliched compass. But I love it. I drew it myself as a reminder that I can always find my way home and back to ME. After that, I kept traveling and coming across totem poles and Native American art that pulled me to dig further and go new places, including acknowledging my own roots. I drew my next four pieces, ready at a moment’s notice to get them. What are they: 2 constellations, an otter and a goat. The otter stands for my traveling buddy and soul mate, my husband. The goat is for me, my Capricorn self. And the constellations, those started as the Big Dipper and Orion, but then the kids were born and before I had either done, they became Scorpio and Sagittarius. Even though I have modern navigation tools, my tattoos remind me of what’s important to me and they’re one more way that I can keep my family close. Forever. This was my first tattoo! I had it done in London, one year after I left Brazil. 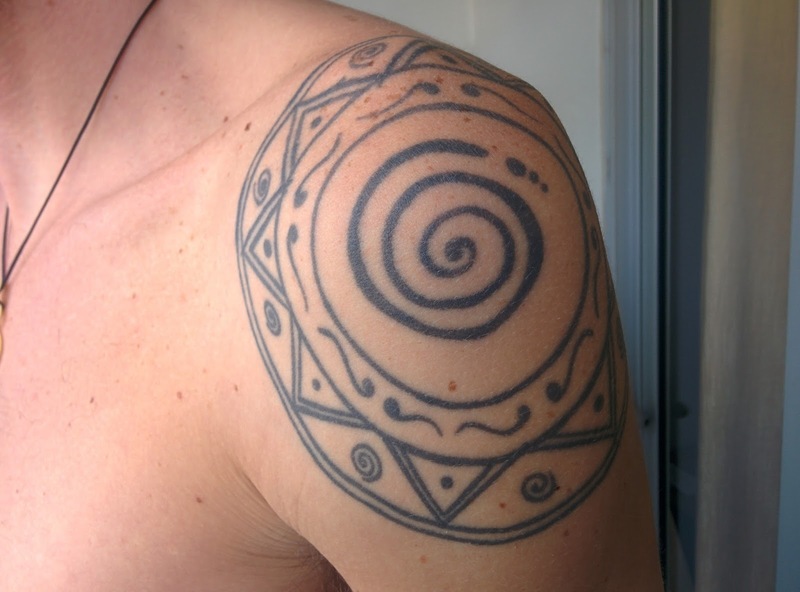 The spirals represent “evolution” and a mix of “self discovery” (if they’re spinning inwards) or “hunger to see or learn about world” (if it’s outwards). It was exactly how I felt then and how I still feel nowadays! 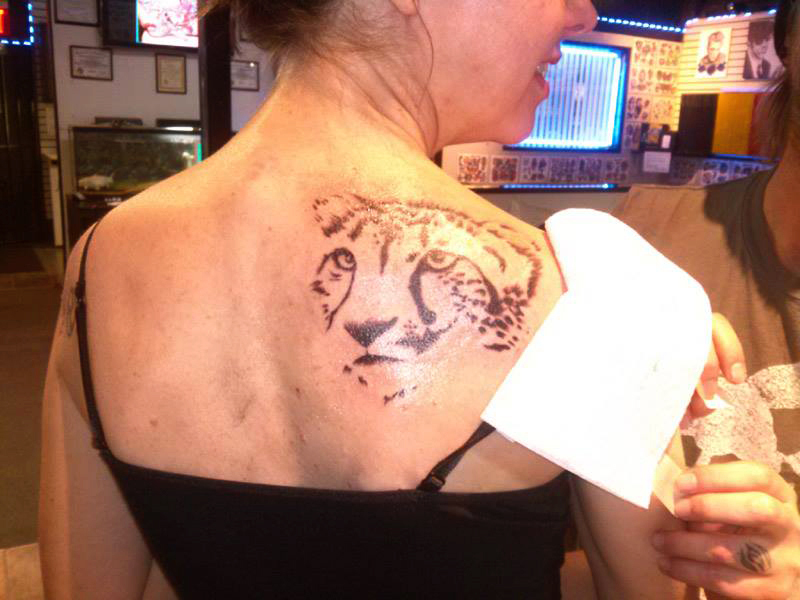 For many years I had wanted an icon-style tattoo of a cheetah; I love their black markings especially coming down from their eyes. 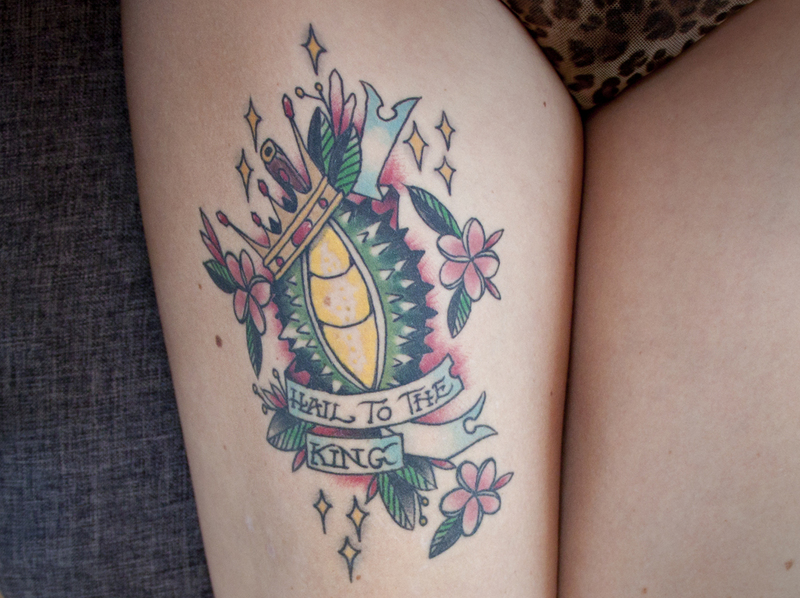 I searched and searched online for just the right photo to base the tattoo on. I have only a handful of cheetah photos from my travels in Africa, taken at quite a distance, but I have many wildlife photographer friends, and I scoured their Facebook albums but nothing ever jumped out at me as the “right” one. Then one day I was idly scrolling through my own photos from Namibia, and lo and behold, I had forgotten about a set of close-up cheetah shots, and one of them leaped right out and said, “I’m the one!” It makes me happy now that my cheetah tattoo is based on my own photo. 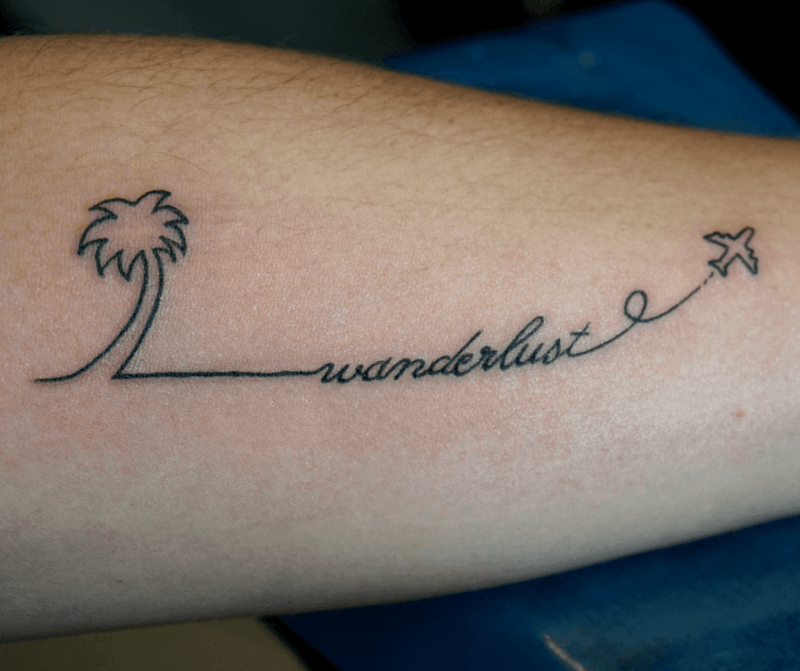 Do you have a travel tattoo that really means something to you? 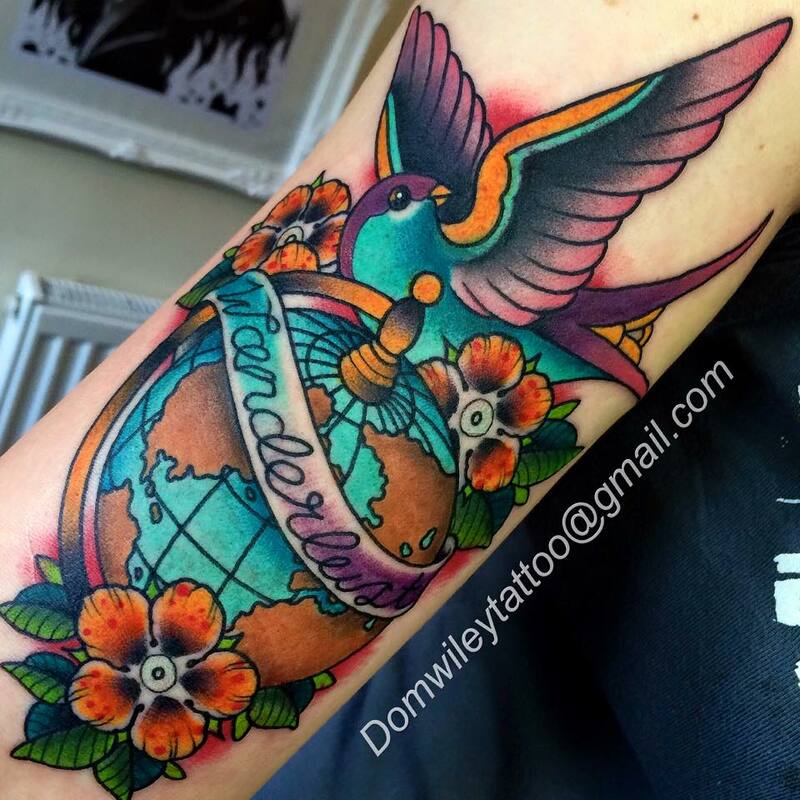 Bookmark this article The most fascinating, inspiring and unique travel tattoos & their stories! People are so clever. Wonderful collection and inspiration. Personally, I am a bigger fan of small and simple. I think the Maltese Cross is my favourite of this collection.